NEMO Bugout 12 x 12 Tarp Shelter. The Bugout™ series is a new category of shelters. These simple shelters consist of a well designed tarp with mesh walls that can either be stowed or easily dropped to offer instant no-see-um protection. 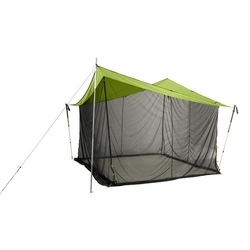 String the tarp between two trees, paddles, or trekking poles, or use NEMO's adjustable height poles to create an escape from rain, bugs, or sun whether you are in the front yard or backcountry. A specially developed mesh with high water repellency protects against side blown rain and effortlessly sheds moisture when it's time to pack up.